“Why We Sleep” is one of the most important health books ever written! How does sleep relate to blood sugars, eating, weight gain, and mindset? Plus, 16 ways to improve your sleep tonight! When I was editing Bright Spots & Landmines, I considered deleting the sleep chapter entirely – it’s the shortest and the last in the book. I feared it didn’t add enough value. After reading Dr. Matthew Walker’s stunning, life-changing book, Why We Sleep, I now have the opposite view: sleep arguably should have been the first chapter in a book about diabetes. Too little sleep might be the most destructive Diabetes Landmine, as it impacts every single area of this disease – how much we eat, what we choose to eat, how we respond to insulin, how much fat we burn when trying to lose weight, emotional resilience and rationality, energy to exercise, and far more. (Why We Sleep, page 133). 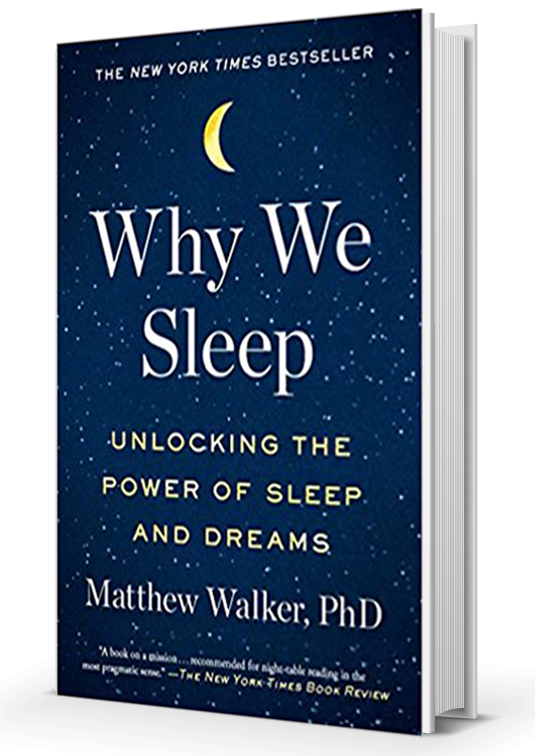 The evidence in Why We Sleep is comprehensive and jaw-dropping, building on 100+ publications from Dr. Walker’s renowned lab at UC Berkeley. I have raved more about this book than any in recent memory, and that’s saying a lot – I read/listen to ~60 books a year. My six major takeaways from Why We Sleep are below, ending with 16 tips to improve sleep. If you live with diabetes or prediabetes, work in healthcare, or know someone who doesn’t rest enough, I strongly recommend this book. Lack of sleep gets too little attention in our world, and particularly in diabetes, and I hope this piece highlights what a tragic mistake that is. Fortunately, sleep is a solvable problem – there are excellent, cost-free, proven strategies to improve it! Is Lack of Sleep The Most Destructive Diabetes Landmine? 1. Is Lack of Sleep The Most Destructive Diabetes Landmine? Insufficient sleep – roughly defined as less than seven hours per night – moves every diabetes and health metric in the wrong direction. Increases the risk of cancer and Alzheimer’s. Why We Sleep made a strong case (for me) that too little slumber is the ultimate Diabetes Landmine. I cannot think of a single behavior that negatively impacts so many other critical areas of diabetes or overall health – what I’ve called a “ripple effect” in previous columns. One of the most compelling sleep studies cited (pages 170-171) took healthy people who had no existing signs of diabetes or blood sugar issues. These participants were limited to sleeping four hours a night for six nights. By the end of the week, they appeared to have prediabetes when challenged with a standard dose of glucose. In other words, lack of sleep – by itself! – moved a group of healthy people into the prediabetes range within six days. Dr. Walker adds that “numerous” labs around the world have replicated this “alarming effect of short sleep” on blood sugars, including with less aggressive sleep reductions. This strongly backs my own personal experience. Another experiment compared 8.5 hours vs. 5-6 hours of sleep per night for ten nights each. The short-sleeping group ate ~300 more calories per day – again, with everything else held constant. (Similar changes occur on 4.5 hours of sleep over just four days.) This amount of food doesn’t sound like a lot, but according to Dr. Walker, it could add up to 20 lbs of weight gain per year. The sleep-deprived groups were also much more likely to reach for high-carb/sugary snack foods (174) – a major Diabetes Landmine. Besides impacting hunger (ghrelin) and fullness (leptin), sleep loss increases circulating levels of “endocannabinoids,” similar to the drug cannabis (marijuana). Endocannabinoids stimulate hunger and increase the urge to snack – i.e., having the “munchies”. Combined, this brings “a potent brew of chemical messages all driving you in one direction: overeating” (174). Studies also suggest the body doesn’t burn extra calories when sleep deprived (175). The takeaway is clear: less than seven hours of sleep makes every facet of diabetes management harder. I have attended well over 1,000 talks at diabetes conferences, and many highlight higher A1c and blood sugar levels seen in adolescents and teenagers with diabetes. Most of these talks highlight obvious challenges in this age group – missed boluses, carb counting inaccuracy, challenging meals, peer pressure, puberty (hormones), and less willingness to wear devices. I cannot recall a single talk highlighting sleep as a critical Diabetes Landmine in adolescents and teens. 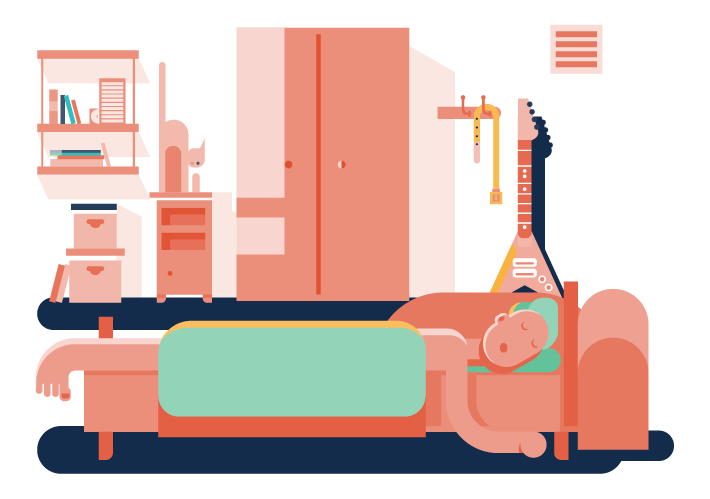 Piecing together parts of Why We Sleep, there is a compelling case that teens are more sleep deprived than ever – and we should be concerned about the diabetes impact. A. The circadian rhythm of teenagers runs on a later schedule than children and adults – teens naturally feel sleepier later at night and therefore need to wake up later. Teenagers also need more sleep than adults. Dr. Walker emphasizes that this is biological wiring – it is not a sign of laziness. “Asking your teenage son or daughter to go to bed and fall asleep at ten p.m. is the circadian equivalent of asking you, their parent, to go to sleep at seven or eight p.m. … Asking that same teenager to wake up at seven the next morning and function with intellect, grace, and good mood is the equivalent of asking you, their parent, to do the same at four or five a.m.” (93-94). B. Many schools start ridiculously early – cutting out precious REM sleep in children and teens. “More than 80% of public high schools in the US begin before 8:15 a.m. Almost 50% of those start before 7:20 a.m. School buses for a 7:20 a.m. start time usually begin picking up kids at around 5:45 a.m. As a result, some children and teens must wake up at 5:30, 5:15, or even earlier... This is lunacy” (308). Books like Why We Sleep and Dan Pink’s When are now building a strong case to move school start times later (American Academy of Pediatrics, Seattle experience). Equally concerning is the period of sleep that is being robbed – early-morning REM sleep. This critical stage helps with emotions, social interactions, and can dictate “the difference between a stable and unstable mental state” (310). This has an obvious impact on coping with diabetes, especially in social settings. Dr. Walker cites a compelling National Sleep Foundation poll: “over 70% of parents believe their child gets enough sleep, when in reality, less than 25% of children 11-18 years actually obtain the necessary amount” (316). The National Sleep Foundation recommends 9-11 hours of sleep for 6-13 year olds; 8-10 hours of sleep for 14-17 year olds; and 7-9 hours of sleep for 18-25 year-olds. This is a perfect storm: teens need more sleep than adults, prefer to get that sleep on a later schedule, are robbed of sleep because of early school start times, and most parents aren’t even aware of the problem! In retrospect, I’m certain that my lack of sleep as a teenager made diabetes significantly harder, stacking all the challenges in #1 and #2 to the already-tough teenage years. Most of those late nights were spent studying, but I’m not positive even that was worth it – Why We Sleep shares convincing data on lack of sleep and impaired learning/memory. The irony is not lost on me: I was staying up late to learn and study, only to impair my ability to remember and learn for the next day! Terrifying aside: more than 50% of all children with an ADHD diagnosis may actually have a sleep disorder, according to Dr. Walker (316). Misdiagnosis is common, since the symptoms are similar. Disturbingly, the treatment for ADHD – drugs like Ritalin – can actually keep the brain awake and make it harder to fall asleep, exacerbating the underlying problem (314-315)! I’ve written a lot about mindset in this column, since it’s such a huge component of managing diabetes well – finding Bright Spots, problem-solving around pesky Landmines, coping with 42 factors that affect blood sugar, calmly interpreting data without judgment, asking better questions, seeking support, coping with stress, etc. Unfortunately, lack of sleep can smother a productive diabetes mindset. “Sleep recalibrates our emotional brain circuits, allowing us to navigate next-day social and psychological challenges with cool-headed composure” (7). Emotional swings are not the only problem. “The frontal lobe, which is critical for self-control and reining in emotional impulses, is taken offline by a lack of sleep. As a result, participants were more emotionally volatile and rash in their choices and decision making” (301). Given the importance of emotional composure and self-control in diabetes – e.g., food choices, dosing insulin, reacting calmly to highs and lows – lack of sleep is a double Mindset Landmine. The data on sleep and emotions extends to the workplace too. Supervisors that reported poor quality sleep were likely to bring “a more abusive nature toward employees the following day, as reported by the employees themselves” (302). When a supervisor sleeps poorly, employee job engagement also declines, even if the employees are well rested. As with virtually all diabetes habits, sleep is not just about me; it impacts those around me. 4. How much sleep do you need? At least 7 hours … But you may not know how sleep deprived you are! Almost 30% of American adults sleep six or fewer hours a night. Across all developed countries, one out of every two adults (~800 million people) will not get the necessary sleep they need this coming week (296)! 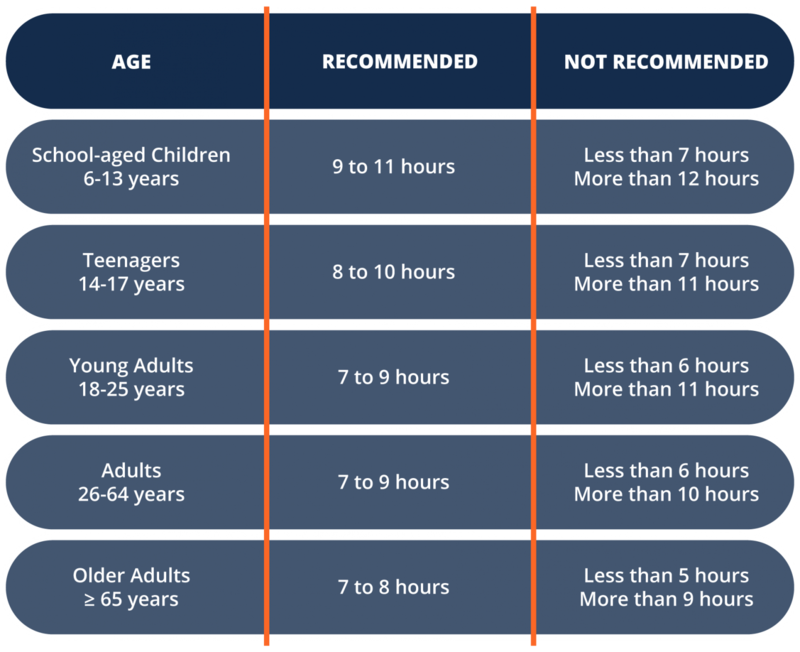 Why We Sleep is pretty clear that humans need at least seven hours of sleep to function optimally, and many ages need more – see this table from the National Sleep Foundation below, which recommends 7-9 hours of sleep for most adults and more for younger age groups. Seven hours, however, doesn’t account for time in bed when you are lying awake. That means if you want to obtain 7 hours of sleep, you may actually need to be in bed for 7.5-8 hours (“sleep opportunity” time). “You do not know how sleep-deprived you are when you are sleep-deprived.” Similar to blood sugars, if you are always running low on sleep, this state can become your new “normal” – and with it, all the “impaired performance, lower alertness, and reduced energy levels” (137). After waking up, could you fall back asleep again at 10 am or 11 am? If “Yes,” you are not getting sufficient sleep quality/quantity. Can you function optimally without caffeine before noon? If no, you are most likely self-medicating your state of chronic sleep deprivation. If you didn’t set an alarm, would you sleep past that time? If so, you need more sleep than you are giving yourself. Do you find yourself at your computer reading and re-reading the same sentence? This is often a sign of a fatigued, under-slept brain (36). “It is far, far more likely that you will be struck by lightning (the lifetime odds being 1 in 12,000) than being truly capable of surviving on insufficient sleep...” (146). One nuance Dr. Walker doesn’t address is the tradeoff between exercise vs. sleep – is it worth getting 45 minutes less sleep to be able to exercise? It would be nice to know where to draw the line on benefit vs. harm – e.g., is 6.5 hours of sleep + 30 minutes of exercise better than 7 hours of sleep + no exercise? That’s a hard long-term study to do, but it is a real tradeoff many people face. “Sleep is not like a credit system at the bank. The brain can never recover all the sleep it has been deprived of. We cannot accumulate a debt without penalty, nor can we repay that sleep debt at a later time” (297). Taking the book as a whole, my interpretation is that poor weekday sleep will bring many of the health concerns discussed above, even with “recovery” sleep on the weekends. Adequate sleep has to be a daily, consistent habit – like everything else in diabetes! Why We Sleep is less about “how to improve sleep,” but it does include many useful tips towards the end of the book. If you have read chapter 4 of Bright Spots & Landmines, you will recognize some of these. Dr. Walker’s #1 piece of advice to improve sleep was a surprise to me: go to bed and wake up at the same time of day no matter what – including on weekends. He notes this is “perhaps the single most effective way of helping improve your sleep” (page 293). This tip is missing from Bright Spots & Landmines, as I hadn’t heard it so strongly emphasized before. I have written about using two phone alarms at night – a “Bedtime is Coming,” yellow-light alarm at 9:45 pm, followed by a “Get Ready for Bed,” red-light alarm at 10:15 pm. This is helpful as a reminder, though it’s easy to turn off the alarms and keep doing stuff. If you have a partner, it helps if he/she is also dedicated to getting more sleep with you; accountability goes a long way. Avoid alcohol intake in the evening. Alcohol robs you of REM sleep (keeping you in lighter stages of sleep), may contribute to impaired breathing at night, and can wake you up in the middle of the night. Dr. Walker broadly says to avoid “evening” alcohol, implying (to me) anything after 6pm. Avoid large meals and beverages late at night – the former can cause sleep-disrupting indigestion, while the latter may prompt frequent awakenings to urinate. I’d add that large, late-night meals can really increase overnight blood sugars, which in my experience worsens sleep dramatically. 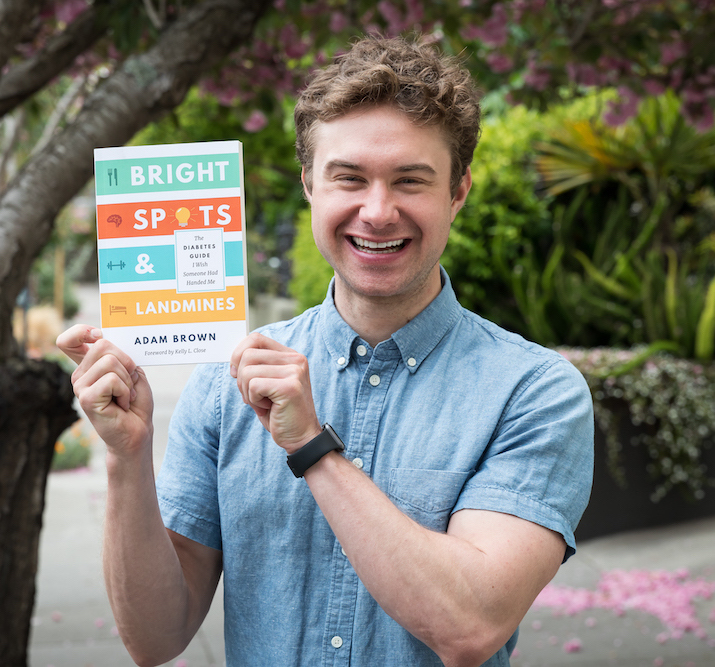 One of my major food Bright Spots is a lighter, earlier dinner with no snacking afterwards – see pages 44-46 of Bright Spots & Landmines. Minimize nighttime light exposure and remove screen technology from the bedroom. I’ve written before about using f.lux on the computer, Night Shift Mode on Apple devices, and switching bedroom lighting to small, dim lamps at night. Take a hot bath (or shower) before bed. I have been doing this for years in near-darkness (night light/candle) and was surprised to learn there is science behind it: body temperature actually drops when you exit a hot shower/bath, which can bring on sleepiness. Plus, I find it helps me mentally unwind before going to bed. Make the bedroom dark, gadget-free, and remove clock faces from view. Clock-watching anxiety at night can make it harder to fall asleep. I use my phone to run CGM and Loop apps, which work in Airplane Mode with Do Not Disturb on. Mentally decelerate and relax before bed. To reduce anxiety-provoking thoughts and worries, I take the aforementioned hot shower, read a physical book, fill out my Five-Minute Journal, and write my morning routine on a Post-It note. Go to bed only when sleepy and never lie awake in bed for a long time – rather, get out of bed and do something quiet and relaxing until you feel sleepy. Don’t take naps after 3pm, and avoid daytime napping entirely if you are having difficulty sleeping at night. Dr. Walker points out that early evening naps are common in older individuals, who might erroneously conclude they have insomnia if sleep is difficult at night. In reality, dozing off in the evening can be the source of sleep difficulty. Wake up to light in the morning. I’ve found the Philips Wake-Up light to be really helpful for waking up in a dark place. If you have trouble falling asleep, Dr. Walker recommends getting outside in natural sunlight in the morning. Some medications can interfere with sleep, including for heart, blood pressure, asthma, cough/cold, and allergy meds. If you are on these medications and typically take them at night, talk to your healthcare provider and ask if they can be taken at a different time of day. Avoid nicotine, a stimulant like caffeine that can make it harder to fall asleep. Don’t exercise within 2-3 hours of bedtime. If you have insomnia, choose Cognitive Behavioral Therapy for Insomnia (CBT-I) instead of sleeping pills. CBT-I is usually administered by an expert clinician, who helps you navigate sleep issues over a series of in-person therapeutic sessions – see good descriptions here and here. A digital CBT-I program, Sleepio, appears to be available for some individuals. Unfortunately, I cannot find an online database of CBT-I therapists, though this will differ depending on your insurance. Why We Sleep shares some concerning stats on sleeping pills, emphasizing they are “minimally helpful,” do not replicate natural sleep, and have concerning side effects. I find it exciting that sleep offers such huge benefits for diabetes and overall health, and improving it is often within a narrow range of choices and habits. Though societal norms and structures (e.g., school and work schedules) can make extra sleep hard, awareness is a critical first step, and Dr. Walker has compiled a phenomenal guide in Why We Sleep. 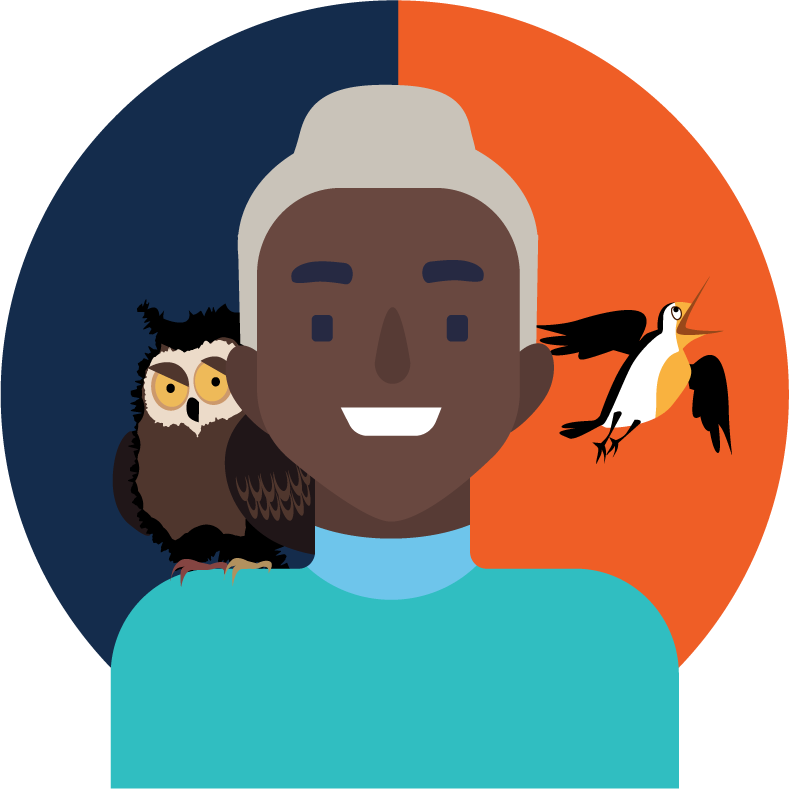 Heart disease – Adults 45+ years sleeping under six hours per night are twice as likely to have a heart attack/stroke during their lifetime vs. eight hours of sleep (165). In a separate Japanese study, it was a 4-5x increased risk! Cancer – lack of sleep is “like pouring gasoline on an already aggressive fire.” Notably, the World Health Organization has officially classified nighttime shift work as a “probable carcinogen” (page 186). Alzheimer’s – inadequate sleep “will significantly raise your risk of developing Alzheimer’s” (161). The book dives into all of the biological connections. Traffic accidents, productivity, learning and memory impairment (key for school-age kids and teens! ), medical errors (terrifying), and beyond. Please send questions and feedback here!